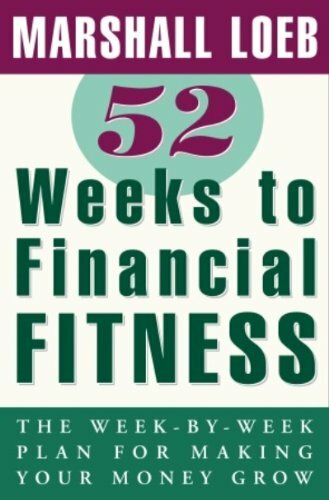 52 Weeks to Financial Fitness is your personal financial trainer — a friendly and authoritative expert that will guide you week by week to manage your finances and make your money grow. In the current frenzied market it’s hard to know whom to turn to for solid advice. Into this void steps the calm presence of Marshall Loeb, personal finance pioneer and former editor of two of the most successful magazines in history, Fortune and Money. Personal finance and investments are a lot like doing exercise. Few of us are happy with our finances or our physiques. For many people, just getting started on a fitness program is the hardest part. But once you begin, you marvel at how easy it is and wonder how you ever did without it. Marshall Loeb’s program for financial fitness, like any good exercise program, starts simply and moves gradually to heavier lifting, boosting your confidence as you move forward. Not only will you learn how to budget your accounts and get your insurance in order, but you’ll also have a strong enough background to choose the investments that are right for you (stocks, bonds, or mutual funds) and the know-how to pick a financial planner and get the most out of his or her services. No matter what kind of financial shape you’re in, Marshall — week by week — carefully brings you to the next level. * Week 2: Ten ways to boost your savings. * Week 7: Design a realistic family budget with Marshall’s three-stage method. * Week 11: Thirteen ways to cut your taxes this year. * Weeks 18 and 19: Get your debt under control and design a sensible borrowing plan. * Week 22: Start investing profitably in stocks. * Week 23: Look into investing in bonds. * Week 33: Cut the cost of your car insurance without cutting your coverage. * Week 46: Calculate and save what you will need to retire comfortably and without worry.